Discussion in 'Map Factory' started by H-land, Jan 22, 2010. Change the name of the map to koth_uyuni in future releases? So, for whatever reason, I decided that I wanted to make a King of the Hill map, and the idea possessed me that I might make a map set in a salt pan, or salt flat, or a playa*, if you'd rather call it that. This map is set on a salt pan loosely based on Salar de Uyuni, a frickin' huge and pretty darn amazing salt flat in the Altiplano of Bolivia. My biggest issue currently is definitely how to balance a map set on one of the flattest surfaces on the planet. I've created an improbable island of sorts, obviously, but it's still quite open. And I need more cactus and rock models. Playa is now on the workshop. *That's with Spanish phonetics, mind you. It should rhyme with fiyah, like what you scream when you're running around like a quick little bunny and happen across a stray flare. It is not in any way related to a playa, like the sort of dashing gentlemanne that would seduce the mother of a quick little fiyah-prone bunny. Or demopimps. whatever you do, do NOT try to add natural features to something that occurs in nature as totally flat. Make the obstacles and cover man-made. for a theme like this, I imagine a train wreck, where the tracks go across the super-flat area, and the cars are all on their sides, dug into the ground and thrown across the landscape. *EDIT*: just saw your screens and I rather like it, actually. Could it have longer sniper sight lines? Even if you want to make it look like a "playa", you dont have to be realistic. First off every corner of your map has a sniper zone, which pretty much means everywhere that's not the point caters to snipers. To combat this, remove the spawn balcony so snipers have to walk to their position. Then expand the capture area of the point to the full size of the wood platform. This will allow people to hide behind the walls while capping to protect themselves from the sniper menace. Next, you'll want to remove all health that isn't the four small ones in the middle. Those are sufficient, especially because the resupply locker is so close by. Having large kits around the outside encourages camping the rim. Then add a door between the now vacant dead end path and the sniper bunker allowing classes to easily storm the sniper and clear him out. Also, consider increasing respawn time, as your map is pretty small for a KotH, though I don't think this was much of a problem. Finally, if you want to nerf sniper sightlines, add a wall outside the window 45 degrees off from it, thus forcing the sniper to (depending on which side you decide to put it on) focus on either the spawn or the other sniper bunker and be blind to the other side. And finally here's a crappy picture that kind of summarizes it. Sorry, but that is the biggest problem with this map. Updated to Alpha 4. More importantly, it was tested and TPG decided to show off his nose in a lovely deathcam shot. Have two large(r) entrances and two smaller entrances to the mid, but the larger entrance should be smaller than the current entrances. 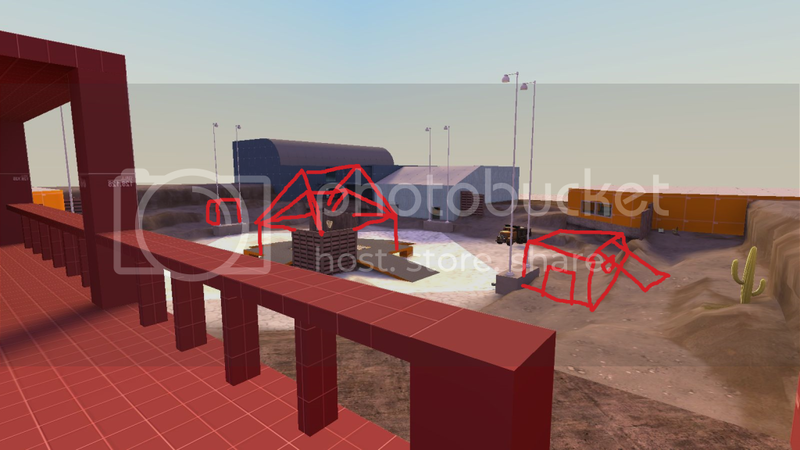 Possibly extend the building by adding more geometry and building attached to it. Make the capping zone smaller. just judging from your main pic, it seems very open. maybe try something like this? Game tonight was probably the best I've played on it. The mid building was pretty easy to hold with a few heavy classes inside, though. I'm worried that with more players that problem would just get worse. Might want to try out some kind of openings on the roof. Yeah from what I've seen above, MAJOR improvements. Overall I think the map could be scaled down which I mentioned to you earlier. Also, some places just felt unused, such as the corner buildings that had doors facing the spawn area. I think you went a little overboard on the additions. The ramp and the new lookout tower thing made the map feel more cramped without actually shrinking the area. I'd remove the ramps and try out a few different kinds of holes in the roof. Nothing too large, just enough to either get some support spam or a demo the enemy isn't aware of can get one good sticky trap detonation. I also think you should close off those far buildings in the corners. They only serve to give snipers a sweet spot to shoot into your spawn buildings. And obviously you need to redesign it there so it's not a dead end. I'm not sure about those new tower things. I didn't use it, but then I never tried. In the beginning it was too open, but now its too messy and too many paths around in my opinon. Hellfire has some good suggestions in my opinon, but I dont like the whole double spawn idea. Its only a koth, and its so small you really dont need two spawns. Closing of a big area like that isnt maybe such idea either. E: I like the access to all roof. Might be just cause Im main soldier tho. I like this, but definitely don't make the orange buildings separate spawns, they're rarely fun, especially when they're so far apart. Edit: Also! The spawns as they are right now are absolutely huge. Please shorten the distance out of them. I like it alot. Needs more flamingo. It's also got a bunch of nice straightaways for the ol' 6:40 Pain Train to barrel down.